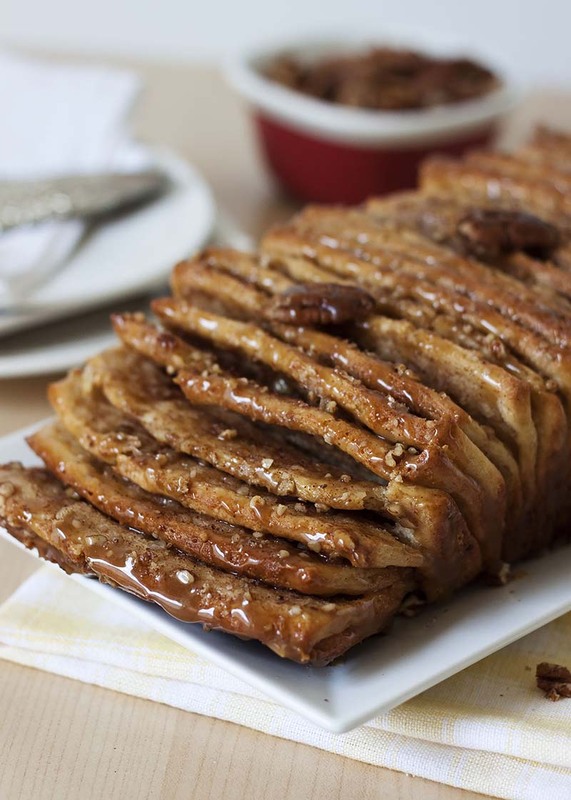 Irresistible, sweet, buttery pull-apart bread layered with cinnamon brown sugar and crushed pecans, baked until it’s golden brown and drizzled with a sweet salted caramel sauce. In the bowl of a stand mixer, using the paddle attachment, combine 2 cups whole wheat pastry flour, yeast, vital wheat gluten, sugar, and salt. In saucepan or microwave safe dish, heat milk and butter until warm (120-130°F); butter does not have to be completely melted. Add to flour mixture. Blend at low speed until moistened. Add egg and beat 3 minutes at medium speed. Switch to the dough hook and mix in the remaining bread flour a little at a time, to make a soft dough, add more or less flour as needed. Knead the dough for 5 minutes. Place in greased bowl, turning to grease top. Cover; let rise in warm place until double, about 1 hour. While the dough is rising, make the pecan sugar filling. In a small bowl, mix together sugar, brown sugar, cinnamon, and finely chopped pecans. Punch down the dough. Cover and let rest 10 minutes. On a floured surface, roll the dough into a 12x20-inch rectangle. Spread 4 tablespoons softened butter evenly over the dough with a rubber spatula or pastry brush. Cut dough in to five strips, each about 12x4-inches with a pizza cutter. Sprinkle 1½ tablespoons of the pecan sugar over the first buttered rectangle. Top it with a second rectangle, sprinkling with 1½ tablespoons of pecan sugar. Continue with remaining rectangles. Cut the stack into 6 rectangles (each should be 2x4-inches). Carefully place the rectangles of dough into the loaf pan, cut edges up, side by side. Loosely cover the pan with plastic wrap and let the dough rise in a warm place until puffy, 30 to 50 minutes. When you gently press the dough with your finger, the indentation should stay. Bake 30 to 35 minutes until the loaf is golden brown. Cover the top with foil if it's browning too quickly. Transfer to a wire rack and let cool in the pan for 10 minutes. While bread is cooling, make the salted caramel glaze. In a saucepan combine brown sugar, corn syrup, heavy cream, butter, and salt. Cook over medium heat, stirring constantly, until sauce comes to a boil. Reduce heat and simmer until sugar is dissolve and sauce is smooth and syrupy, about 2 minutes. Stir in vanilla extract and chopped pecans. Use the parchment paper/foil to remove the loaf from the pan. Flip the loaf over onto a cooling rack, remove the parchment paper/foil, then flip onto another rack so that it’s right side up. It looks yummy. I’m gonna try this out.